Temperature observations show the trend of increasing maximum and minimum absolute temperatures in the period 1961–2015, which indicates global warming. The number of hot days is increasing, including the frequency of extremely hot days with daily maximum temperature above 35 °C. In the summer of 2013, the highest temperature ever recorded in Slovenia was measured for the second time in history, while local temperature records were broken at several temperature measurement sites. The number of days with temperatures below zero shows a decline. However, precipitation (storms, hail) is more variable than temperatures. In the past two decades, Slovenia was faced with severe droughts that sometimes occurred in consecutive years, as well as with extensive flooding. Sometimes drought and floods occurred within the same year. This indicator shows annual extremes: minimum and maximum air temperatures, number of days with temperatures above and below the selected threshold and maximum snow cover in six places across Slovenia. 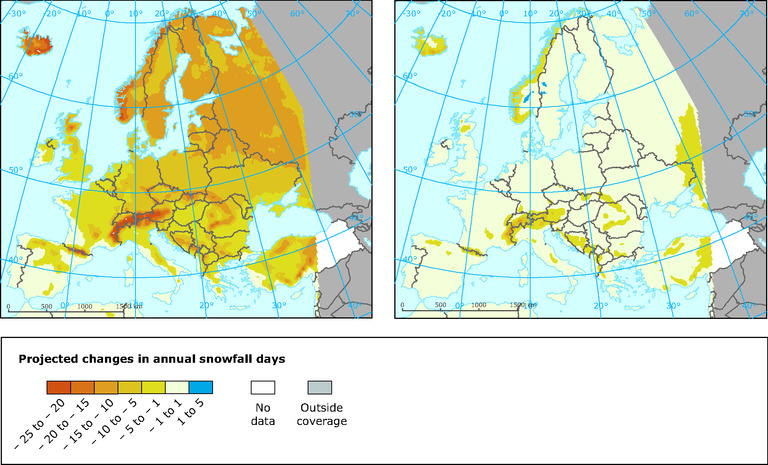 Predicted changes in the number of days with snowfall and predicted changes in abundant winter and summer precipitation are based on data compiled by the European Environment Agency. European Environment Agency, Indicators, Snow cover, 2016. Note: The figure shows projected changes in the number of days with snow between the periods 1971-2000 and 2041-2070. Left figure shows snowfall over 1 cm, the right snowfall over 10 cm. In Slovenia it is expected to reduce the number of days with snow at least 1 cm from 1 to 5 days and sometimes up to 10 days. For heavier snowfall over 10 cm per day, for the most part of the country is not expected to change significantly. Note: The figure shows change in heavy rainfall (in percents) between the periods 1971-2000 and 2071-2100 in the adverse scenario of rising greenhouse gases. On the left are the changes in the winter period and on the right changes in the summer period. In summer, figure shows a small increase in the northeast of Slovenia and in winter significant increase throughout the country. to incorporate adjustment mechanisms into development plans. In this century, we are witnessing more and more severe weather events and weather changes, often with catastrophic consequences (World Meteorological Organisation, The global climate 2001–2010, 2013). Aside from the growing frequency of extreme events, our modern way of life and ill-considered activities affecting the environment have been resulting in increasing damage caused by such events. There were an increasing number of deviations from usual weather conditions in the period 1961–1990. Droughts and floods caused by abundant precipitation have been becoming increasingly common. Downpours and fierce storms with strong wind gusts have been taking place each year and heat waves are becoming more frequent and more severe. In the 1961–2015 period, the rising trend of absolute maximum and absolute minimum temperatures was observed, which points to climate change. The absolute annual minimum temperature has been growing, whereas this trend is less apparent with absolute maximum air temperature. In this century, a notably greater frequency of very hot days has been observed with temperatures up to or over 35ºC. In the summer of 2013, the all-time highest temperature was recorded at several meteorological stations and the highest Slovenian temperature ever recorded was matched. The summer of 2003 stands out for its temperatures; it was exceptional due to its length and heat intensity. During this summer, there were a record number of hot days. No summer recorded in the long-term series of data, reaching more than 150 years back in this region, can be compared to the summer of 2003. The number of hot days per annum is rising and the number of cold days is decreasing. However, as natural variability is greater than the long-term trend, differences between individual years are considerable, while the trend is seemingly less obvious. According to the foreseen development of the global climate, an average summer in the second half of this century will be as hot as the summer of 2003. The data on the maximum snow depth in lowland areas reveals a downward trend, while in high mountainous regions, variation from year to year is significant. There is also no evidence to conclude that the lack of snow cover in lowlands means a modest snow cover in high mountainous regions. 2001 was exceptional for its snow cover in high mountainous regions, where the all-time record snow depth was measured, while in the lower regions, the same winter was ordinary. In the western Julian Alps, snow cover was exceptionally abundant in November and December 2008. Nevertheless, snow is expected to be less abundant in the future, in lowlands and mountainous regions, alike. In December 2015, there was no snow cover at Kredarica for most of the month. In the lowlands, a trend of declining snow cover in the spring months has been observed. Most damage of crops is caused by late snowfall. 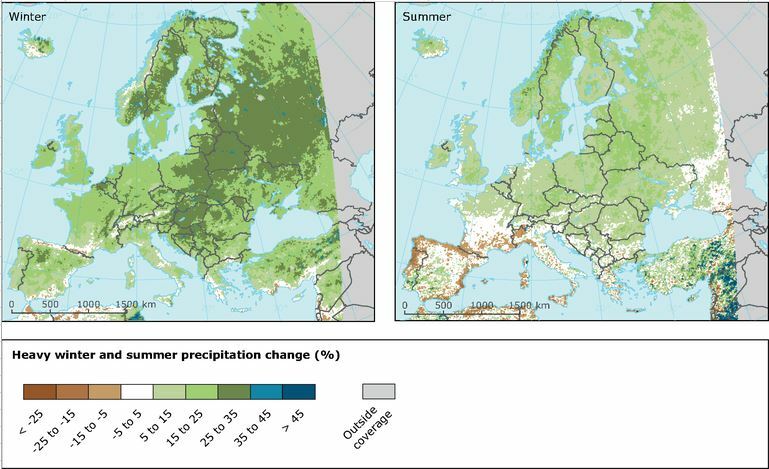 In Europe, a change in snow cover is to be expected in future decades, which will affect the albedo of the ground, water reserves, flora and fauna, ecological conditions, agriculture, forestry, tourism, winter sports, transport and electricity production. Nevertheless, variation in precipitation is much greater than in temperature (World Meteorological Organisation, 2013). Precipitation regimes are changing, which affects the number of days with precipitation above the selected thresholds. Regional differences can be a result of different precipitation regimes. Apart from changes over the course of the year, changes in the frequency and intensity of precipitation during individual seasons of the year are more important. Each year, there are more storms with strong winds, downpours and hail. Extremely intensive precipitation that lasts a few hours or perhaps a day or two occurs locally, potentially causing landslides and local flooding. Almost every year, there are incidents of powerful winds that uncover roofs and topple trees. Disastrous droughts and floods are becoming more and more common, sometimes occurring in consecutive years and sometimes within the same year. For a number of years, the National Meteorological Service has been publishing descriptions of extraordinary weather events on the website Izredni dogodki (ARSO, 2016). The descriptions include a detailed analysis of weather conditions that led to an extraordinary event, a comparison of measured values with historic values and an assessment of the return period for the measured values.